For 24 hours we will create as much art as we can, share it on social media for all to enjoy and have fun. We will also participate in mini challenges and be eligible for prizes through out the day. 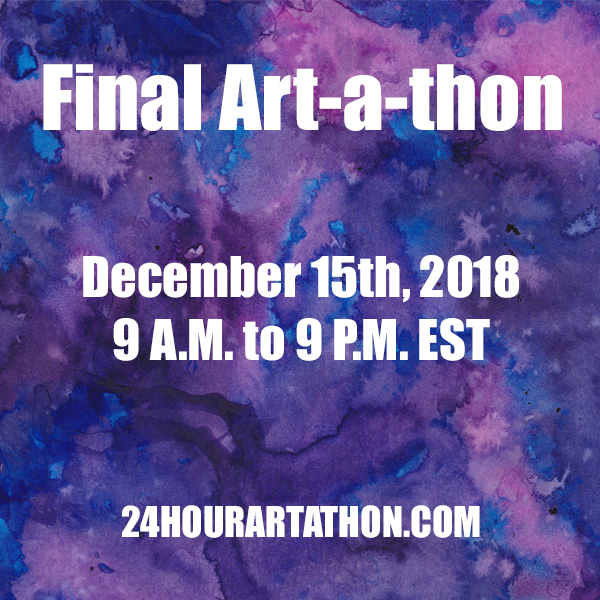 The idea for the 24 Hour Art-a-thon came from Melissa over a year ago. She has participated in several read-a-thons which she has enjoyed. Her favorite read-a-thons are the 24 hour ones since its much easier to dedicate a day then a whole week to mostly reading. One day she decided to look for art-a-thons but could not find any. Melissa decided if she couldn’t find one maybe she should create her own. Even though hosting the art-a-thon alone could be doable, it would be much easier and more fun if there were more hosts. However due to her busy schedule and being unsure of who would join her, a year had past before she decided to ask a few of her artsy friends and thus the 24 Hour Art-a-thon was born.